I bought this 1978 Texas Instruments Speak & Spell from eBay. Then I modified it to make it better. 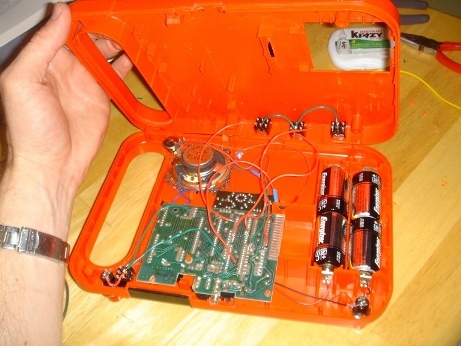 I pretty much went by the plans for circuit-bending this model laid out by Reed Ghazala in his book on the subject (Circuit-Bending: Build Your Own Alien Instruments ). This is also called an incantor and the instructions for building one are laid out in this article by Reed Ghazala except that it uses a Speak & Read. While trying to find a pitch control circuit, I did find a different bend that turned out to be really good. I put a roller ball switch on the inside and ran it through the potentiometer, so that it takes effect only when the machine is turned over or shaken. The pot doesn't really make much noticeable difference. Here are some demos of the performance of this Speak and Spell Incantor. My only advice at this point is to keep in mind that this activity is for small battery powered electronics only. 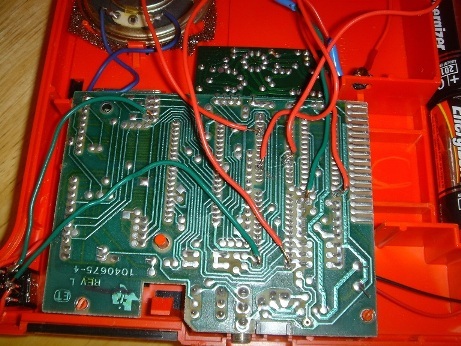 Also if you are planning on buying a soldering tool, a battery powered one may not be the best choice. I used a Weller BP645 and I noticed that I only got a few good hits on it then it wouldn't get hot enough and caused some sloppy soldering. I had to replace the batteries (3 AA), which were still fine for other uses, three times before finally going and buying a regular one with a cord. Here are some free downloadable normal and bent sounds from this speak and spell incantor in both MP3 and wav format. For comments please visit the blog post or email me.